The New Year is one of the most important holidays in Chinese culture. Known as "Winter Fiesta" in China, the celebration goes far beyond the borders of the home nation. Following the official New Year's Day festivities-- January 23 this year--the City of Chicago has plenty to offer in events, and of course cuisine. Check out these events and locales as you partake in the celebration. The 2012 Lunar New Year Parade celebrating the Year of the DRAGON 4710 will include marching bands, floats, lions teams, a mystical dragon, and Miss Friendship Ambassador. Join and welcome the New Year as we convey GUNG HEI FAT CHOI to all in attendance! The parade begins in Chinatown at 1pm! This event includes a special Community Awards presentation to individuals and businesses whom have demonstrated exceptional leadership and contributions to Chicago's Chinatown community. To register online, click here. This World-Class City also has plenty of places of interest to celebrate the Chinese New Year, and enjoy the culture all year long! Into astrology? See the 12 statues for every sign of the zodiac....Remember, these signs are based on the year you were born, not the month--check them out! 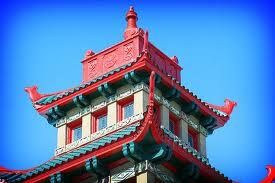 This amazing piece of architecture is typical of the City of Chicago as well as the Chinese culture. You can't go to Chinatown without stopping by the centerpiece of the neighborhood. A tribute to those who served in the armed forces, this 7 year old memorial was long overdue. Being the only museum in the midwest dedicated to Chinese culture, this is a must-visit. Learn about Chinese history from the 1800s through today, and take in the spectacular gallery space. Cuisine by the famous and Chicago-loved Tony Hu. Check out any of his amazing restaurants--there's 5!